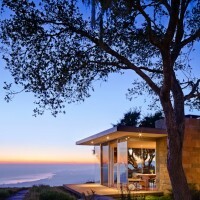 Neumann Mendro Andrulaitis Architects designed this residence in Carpinteria, California. This contemporary residence is designed to seamlessly open unto the panoramic coastal ridge-top site via expansive operable glazed walls. 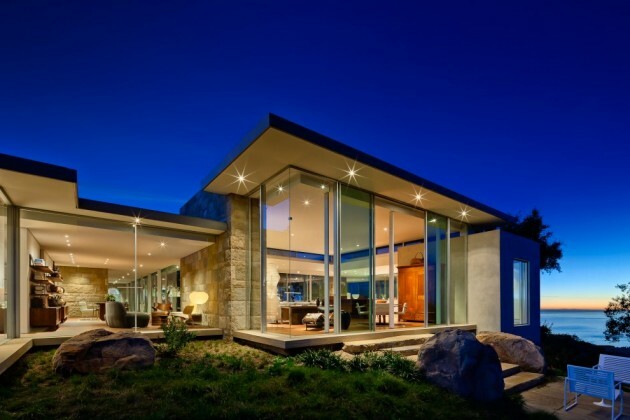 The glazed transparency is balanced and the home is anchored in place by substantial cut native sandstone walls. The architectural design evolved from our client’s desire for a home that is a tranquil place for living, art and retreat. 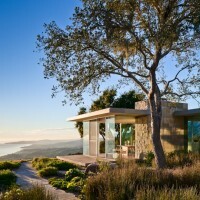 The project site is located on a ridge in the foothills of Carpinteria, ten miles down the coast from Santa Barbara. The program asked for a master suite, one guest room, a study for two, a more contained den and an informal open living space they could share with their children and grand children. 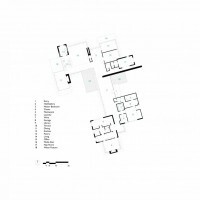 The site strategy was to separate the guesthouse, pool and pool house from the main house, by locating them amongst the oaks on a lower terrace. The smaller structures were easier to place around the mature oak trees without disturbing their root systems. 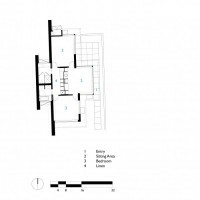 Each structure has its own orientation and privacy. How to develop a strategy with dramatic 360-degree views was a challenge for laying out the main house. Placing the main living space and study further away from the edge was determined to be quieter from the distant freeway noise. 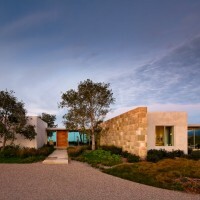 A courtyard created an inward oriented counterpoint to the distant vistas. 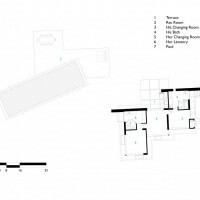 A flat roof modernist scheme complemented the couples taste for modern art and furniture. Designers in their own right, they were the driving force in the overall design team. 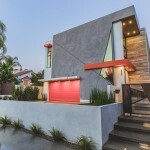 The design was limited to a simple palette of materials and forms. A European window and sliding door system was used to minimize the frames and optimize the glass. These glass walls were framed between large stonewalls constructed of the local Santa Barbara Sandstone, and volumes contained in plaster walls with an integral color (pantry, guest room, master bath and closet, storage area). The flat roofs were supported by steel columns separated from the curtain walls. The landscape design became a hobby of the owner who studied local native plantings that were both fire resistant and drought tolerant. Some large oak trees were brought in to augment the existing oak grove, further nestle the house into the site, and create a foreground to help frame the spectacular views. 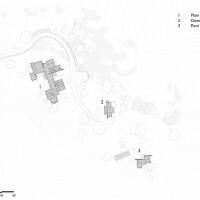 Visit the Neumann Mendro Andrulaitis Architects website – here.